Corncockle (Agrostemma githago) has been hitting the news in recent weeks, as Countryfile has been accused by The Telegraph for promoting the distribution of poisonous seeds via Kew Garden’s Grow Wild project. The over reaction has been called out by the Guardian online, and in a great blog post by Miles King. In short, corncockle does contain toxic compounds, but they are unlikely to cause ill health unless large quantities have been eaten. Agrostemma githago flower “Agrostemma githago 120605”. Licensed under CC BY-SA 2.5 via Wikimedia Commons. 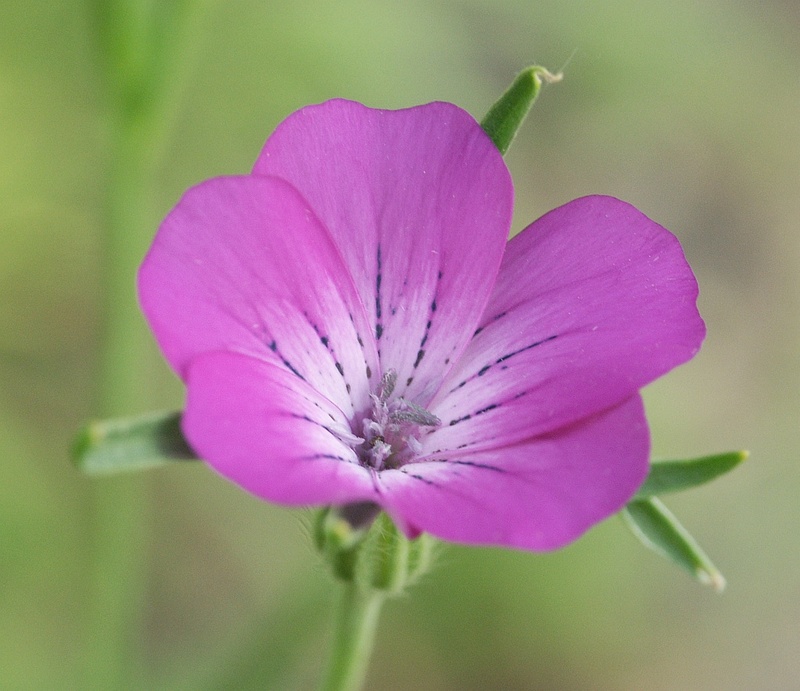 The reason why corncockle seeds are being distributed by the Grow Wild project is that the plant is now very rare in Britain. The seeds rely on disturbed soil conditions to germinate, and are only distributed by being sown alongside cereal seed corn (Hellmund 2008). Aside from the health risk aspect, corncockle also features in the complex debate on invasive alien species, as corncockle is an archaeophyte, having been introduced to Britain in the later first millennium BC. From an archaeological perspective, the identification of non-native species in archaeobotanical samples containing cereals can be used as evidence for the trade in cereal grain between areas where an arable weed is present, and where it is absent. in the later first millennium BC, corncockle is present in France and Germany (Hellmund 2008), but still absent from Britain and the Netherlands. Hence, it’s presence in southern Britain in the mid first century AD has been associated with cross-channel grain movements (Fuford 2004), related to the trade between oppida (Late Iron Age proto-urban settlements) and the Roman world, or the movements or supply of the Roman military. Remains of corncockle are identified in several forms from archaeological sites. Most commonly, charred intact seeds are identified. The seeds are large triangular shapes, and have a distinctive papillose surface texture – see this image in the Netherlands seed atlas. The triangular tips of the seed capsule are also occasionally found in charred samples as well. Both the seeds and capsule fragments are of a similar size and weight to cereal grains, so that they both make it through the various crop-processing stages up until the hand-cleaning of cereal grains. Fragments of corncockle seeds are commonly found alongside cereal bran, chaff, grassland plants and bedding material, such as heather and bracken, in waterlogged conditions. Such an assemblage is commonly interpreted as material collected from stable floors, disposed of in pits or wells. The combination of fragmented seeds and cereal bran indicates that the material that has been fed to, and digested by, animals (probably horses) (Kenward and Hall 2012). Finally, fragments of corncockle seeds can also be found in calcium-phosphate mineralised deposits in latrine pits, such as at Saxon Winchester. Whole corncockle seeds were identified, as well as impressions of the seed coat (see Carruthers 2011 for pictures). Bury Hill, Hampshire. 1 charred corncockle seed was found alongside barley grain and spelt chaff from a Mid Iron Age pit, within a hill fort on the Hampshire downs (Campbell 2000). Silchester, Hampshire. Corncockle seeds have been identified from waterlogged sediments at the oppida. First, in a Late Iron Age well at the Forum-Basilica site c. 25-15 BC (Jones 2000), and second from a later Late Iron Age well in Insula IX c. AD 30-55 (Lodwick 2014). Suddern Farm, Hampshire. 5 seeds have been found in a charred deposit of barley and spelt crop-processing waste, from a pit in a Late Iron Age enclosed rural settlement (Campbell 2000). Thruxton, Hampshire. 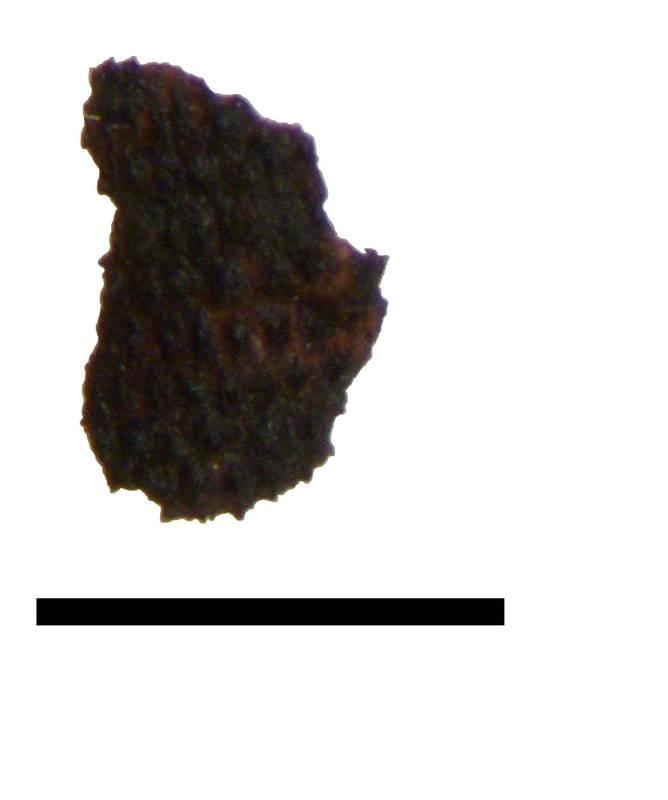 1 charred corncockle seed was identified from a Late Iron Age enclosure ditch, amongst spelt crop-processing waste (Campbell 2000). Winchester, Northgate House. A few charred corncockle seeds were present alongside some barley and spelt wheat grains in a silty soil overlying Iron Age occupation (Carruthers 2011). Following the Roman invasion in AD43, corncockle seeds become more common. Yet, as corncockle was already present in some areas pre-conquest, its identification cannot always be interpreted as indicating imported cereal grain from the continent. However, the weed species present amongst a few finds of cereal grain stores do indicate the long distance transport of cereals. Isca grain, Caerleon. A deposit of charred grain from the Roman legionary fortress contained Agrostemma githago, Lathyrus cicerea, Raphanus raphanistrum and Vicia sativa (Helbaek 1964). London forum grain. A layer of charred cereal grain has been studied from buildings lining the London Forum, destroyed by Boudica c. AD 61. The store was dominated by spelt wheat, and contained Agrostemma githago, Lens culinaris and Vicia ervilia. Coney Street, York. A charred deposit of spelt wheat grains from a late first/early second century military granary contained Agrostemma githago, Consolida spp., Delphinium sp., Lathyrus aphaca and Raphanus raphanistrum (Williams 1979). In these examples, the co-occurence of corncockle alongside other non-native weed seeds does suggest that cereals were imported from the continent.The presence of corncockle in later archaeobotanical studies, and the potential effects on health, are summarised here by Allan Hall. Whilst the focus in the last few weeks has been on the (over exaggerated) negative impacts of corncockle, the species is a very useful tool in archaeology! Campbell, G. (2000). Plant utilization: the evidence from charred plant remains. In B. Cunliffe (Ed. ), The Danebury Environs Programme. The Prehistory of a Wessex Landscape (pp. 45–59). Oxford: Institute of Archaeology. Carruthers, W. (2011). Charred and mineralised plant remains. In B. Ford, S. Teague, & E. Biddulph (Eds. ), Winchester – a City in the Making: Archaeological Excavations Between 2002 and 2007 on the Sites of Northgate House, Staple Gardens and the Former Winchester Library, Jewry St (pp. 363–373). Oxford: Oxford Archaeology. Fulford, M. (2004). Economic structures. In M. Todd (Ed. ), A Companion to Roman Britain (pp. 309–327). Oxford: Blackwell. Haslam, R. (2012). Iron Age and Roman settlement and burial activity at Old Kempshott Lane, Basingstoke. Proc Hampshire Field Club & Archaeological Society 67(1): 79–141. Helbaek, H. (1964). The Isca grain, a Roman plant introduction in Britain. New Phytologist 63(2): 158–164. Hellmund, M. (2008). The Neolithic records of Onopordum acanthium, Agrostemma githago, Adonis cf. aestivalis and Claviceps purpurea. Vegetation History and Archaeobotany 17: 123–130. Jones, M. (2000). The plant remains. In M. Fulford & J. Timby (Eds. ), Late Iron Age and Roman Silchester: Excavations on the Site of the Forum Basilica, 1977, 1980-86 (pp. 505–512). London: Society for the Promotion of Roman Studies. Britannia Monograph Series No. 15. Kenward, H., & Hall, A. (2012). Dung and stable manure on waterlogged archaeological occupation sites: some ruminations on the evidence from plant and invertebrate remains. In R. Jones (Ed. ), Manure Matters: Historical, Archaeological and Ethnographic Perspectives (pp. 79–95). Farnham: Ashgate Publishing Limited. Lodwick, L. (2014). Condiments before Claudius: new plant foods at the Late Iron Age oppidum at Silchester, UK. Vegetation History and Archaeobotany 23: 543-549. Straker, V. (1984). First and second century carbonised grain from Roman London. In W. Van Zeist & W. Casparie (Eds. ), Plants and Ancient Man: Studies in Palaeoethnobotany (pp. 323–329). Rotterdam: A. A. Balkema. Williams, D. (1979). The plant remains. In H. K. Kenward & D. Williams (Eds. ), Biological Evidence from the Roman Warehouses in Coney Street (pp. 52–62). York: Council for British Archaeology.